We absolutely adore this cute and classy idea from Aisle Always Love! Pop the question to your beautiful ladies with a bottle of their favorite wine. 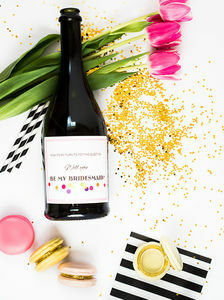 You can use these wine labels on practically any type of smooth drink bottle to ask the special ladies in your life to be there on your big day. These trinket boxes are cute enough to be a gift all by themselves, or you can hide something inside to light up your ladies day. Aisle Always Love offers some super cute accents for the home that double as gifts and are the perfect way for pretty to meet practical. This darling eye chart art print would be perfect to spruce up any room. It's almost guaranteed that these copper mugs will make you smile every time you grab them for a drink. On the wedding morning after the groomsmen are groomed share a round of drinks in these State Etched Rock Glasses. This art print says it all. Feel free to peruse Aisle Always Love's sock collection here. Ward away cold feet on the wedding day with this cute sock label idea. These "I mustache you a question" sock labels help you pop the question and make one less piece of clothing for your groomsmen to obtain! Send your groom a little love note with a pair of cozy socks to match with this True Love Label.